Bsnl 298 Plan , BSNL 298 FRC Plan – Hi Guys , Hope You Are Doing Wonderful Nowadays With Our Stunning Tricks Of Free Recharge Apps. BSNL – Bhartiya Sanchar Nagam Limited Has Launched The New Plan For Customer Willings to Enjoy The Free Calls & Data Benefits. 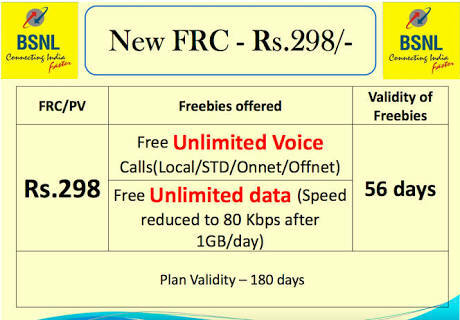 BSNL Has Launched New FRC 298 Plan In Indian Market. Operators In Indian Market Are Still Struggling To Match The New Comer Reliance Jio. Jio Has Stunned Indian Market With Free Unlimited Data & Calls in its New Jio Dhan Dhana Dhan Offer. BSNL Also Trying To Re-Capture The Indian Market With Back To Back Free Data + Calling Plans , They Have Already Launched The BSNL 444 Plan ,BSNL 249 Plan , BSNL 339 Plan , BSNL 333 Plan etc. Its Clearly Seen , BSNL Has Better Plan The AIRTEL 399 Plan & JIO 399 Plan , Both Airtel & Jio Has Offering The Similar Benefits Like 1 GB/Day & Unlimited Calling. So , This is Another Telecom Plan To Counter The Reliance Jio 399 Dhan Dhana Dhan offer , If You Are New BSNL User & Haven’t Subscribed Any Plan Before Then This is Best Recharge Option For You.